In this filmmaking motion graphics tutorial, we jump into Adobe Premiere and look at 4 different motion graphics techniques. 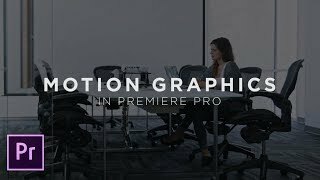 Creating motion graphics in After Effects is usually preferred, however there is still quite a lot that can be accomplished inside of Adobe Premiere. We’ll lock at double exposure, motion blur, clean title cards, and text behind objects. Great tutorial! Love the motion blur – so simple! I found it funny that you said it can save you time not having to export into After Effects but then immediately talked about having to do frame by frame rotoscoping because Premiere doesn’t have a tracker. can u gice that video? women stay in sea? Awesome and super helpful video my friend. Thanks so much!! Nice tutorial. You have a good day too!